Filled with rich vocabulary and meaningful life lessons, Aesop’s Fables have been enjoyed by children for centuries. 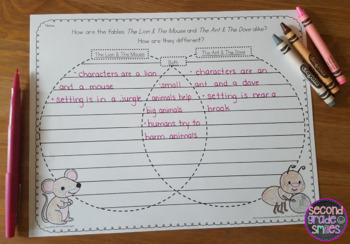 Reading, discussing, and writing about fables encourages students to think deeply and connect actions with their consequences. With over 250 pages of teaching materials, this bundle includes everything you need to teach fables for understanding! Three unique teacher resource files are included in the two bundled fables products. The first file is a readers theater resource. It includes two group direction page options, as well as three to five part readers theater scripts and character crowns for ten of Aesop’s well-known fables: The Ants & The Grasshopper, The City Mouse & The Country Mouse, The Hare & The Tortoise, The Lion & The Mouse, The Shepherd Boy & The Wolf, The Ant & The Dove, The Fox & The Crow, The North Wind & The Sun, Belling the Cat, and The Fox & The Stork. For each fable, a master readers theater script is included as well as a copy of the script with each actor’s role highlighted. Just print and go! Character crowns are also included. These can be printed on card stock, colored by students, and stapled to a sentence strip to create a wearable headband. 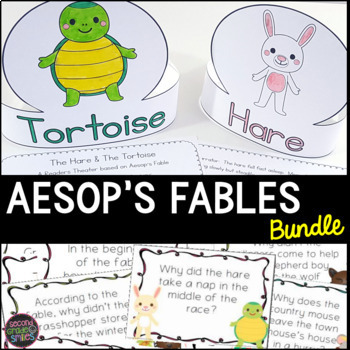 The second file is a PowerPoint featuring a brief introduction to Aesop and the fables genre as well as three open ended questions to accompany each fable. 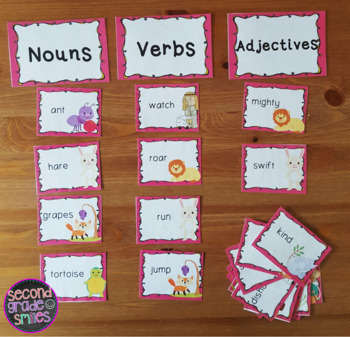 Display them with a projector and use them for partner discussion or quick write responses with the whole class, or print them out and use them in small group literature circles or guided reading groups. 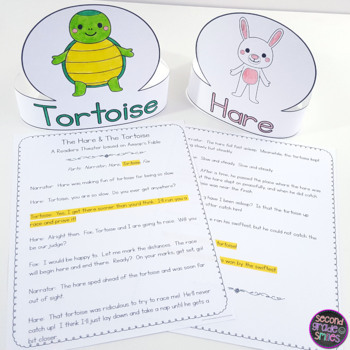 You may choose to use the readers theater scripts to accompany all of the above activities. In my own classroom, I also used the versions retold in Aesop for Children by Milo Winter, which is available from the Library of Congress free of charge. Visit http://read.gov/aesop/ to print the fables you wish to use. Please click the product name below to visit the individual product page or click the preview button to view photos and samples.